Oh, I hate to admit this, but I don’t have many food pictures. I started out with good intentions but as I proceeded through the cooking, stopped taking photos. And then when the evening of the party came, I was too busy attending to twenty-two guests that I didn’t have time to snap any photos of the food. Things started out good, with lovely pictures of ingredients before I started cooking. 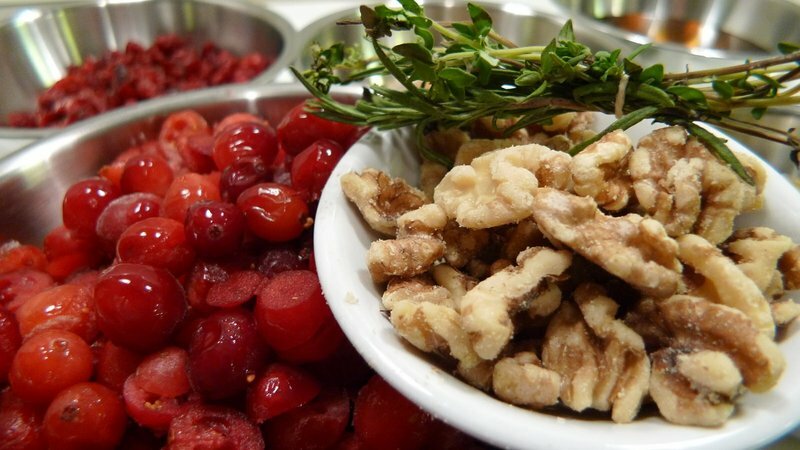 But then I got caught up in the process of preparing dishes like this cranberry-walnut relish from the New York Times, and left the camera sitting in its bag. 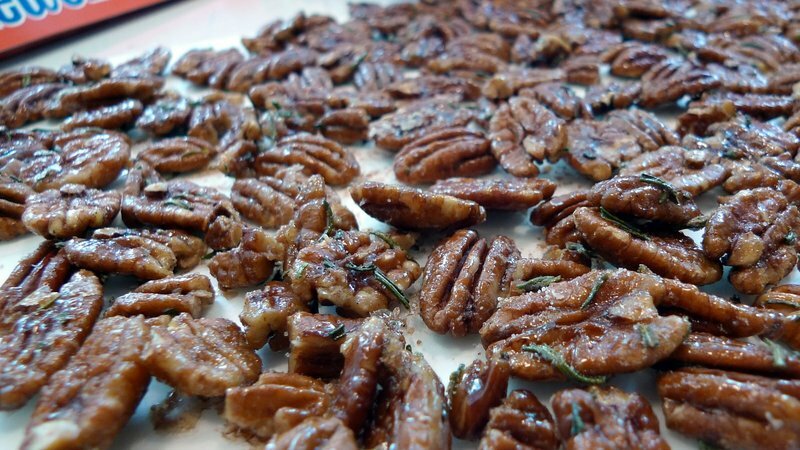 The opposite happened with this maple and rosemary candied pecans. I got the end result but nothing along the way. We set up in the cafe downstairs about 4 pm. The sun was low enough and the breeze was blowing so the outdoor seating was pleasant. Eventually, the sun set, dinner was served, and we had quite a good sized crowd, enough to fill all the available seats with a few people left standing. The set-up worked well as they have a small kitchen with an oven and two induction burners in the back, so I was able to keep dishes warm in advance of serving. The two staff members were helpful but took little initiative. If you wanted something done, you really had to explain step by step what you wanted them to do. I asked them to slice some bread and so they sliced it and put it on a plate, but never brought it out. I hadn’t said, “slice, put it on a plate, and set it out with the other food” you see. Our Kansas City visitors, Jack, Craig, and Matt. 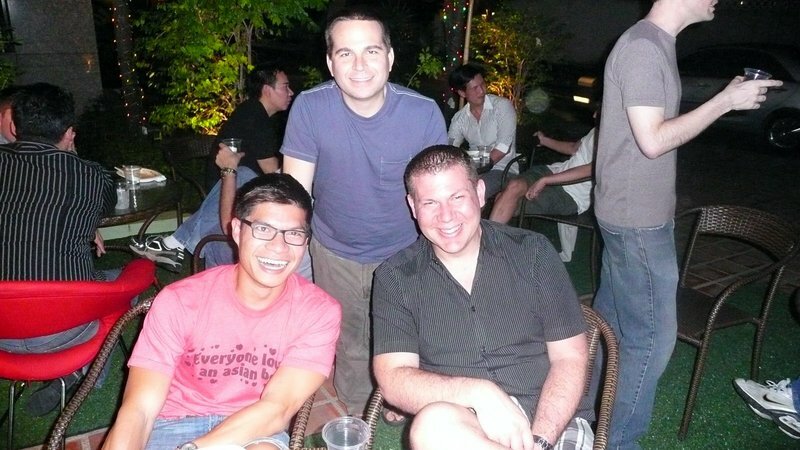 They head off to Chiang Mai on Sunday and we’ll meet up with them in Phuket later in the week. 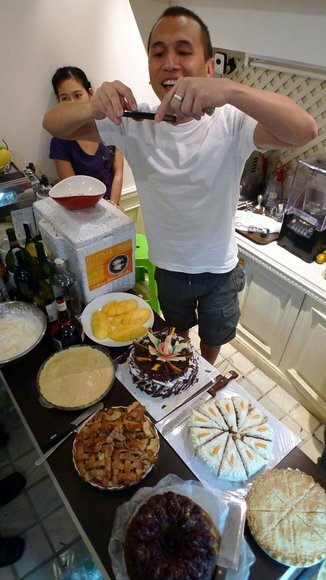 The only food shot I have at the party – Tod snaps a photo of the desserts. This entry was posted in Uncategorized and tagged Thanksgiving by christao408. Bookmark the permalink. What’s the temperature over there right now? Looks comfortable. Looks like an excellent set up for the cafe and dinner. You do a great job. Looks like all were having a good time. @CurryPuffy – Sorry, the only picture I have of the turkey breasts is the before shot. I got really caught up in the cooking process and showing guests around and didn’t get any pics. @Roadlesstaken – The evenings are pleasant, high 70s with light breezes. Daytime has been in the mid-80s and in the direct sun it is not very nice. Humidity is down to only about 60% which is low for us. @murisopsis – Actually, I ended up not making it. I realized that I had to draw the line at some point and couldn’t make everything. However, our guests will be back next weekend and I’d like to have them for brunch on Sunday, with mac cream pie as dessert. @yang1815 – Yep. @Fatcat723 – People really enjoyed themselves and that is the most important thing. 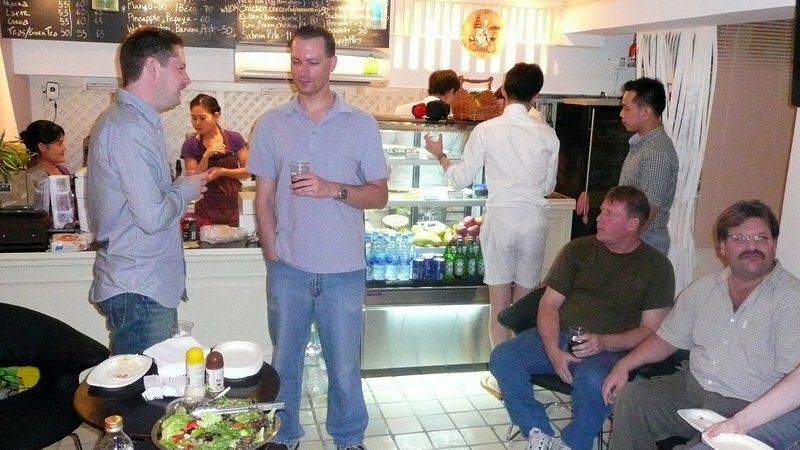 everything turned out nicely….the food and the place, though the staff were a bit as you’ve said less initiatives…anyway glad that you had a good party! Everyday I check my news on the net… the Republicans win the midterms; North Korea creating havoc; and now to read this on your blog “… I don’t have many food pictures.” Good lord – what is going on? I’m glad that the dinner turned out well and the weather was nice. It’s always great to be surrounded by good friends and good food. I’m just so tickled your last minute move to the cafe worked out for you! Wait I’m so confused! You had Thanksgiving at a cafe? Was it rented out or something? Cause I think that party shin-dig was totally awesome! Would be cool to do something like that over here but everything is closed around here. Food looks delicious by the way. Great shots of the food! 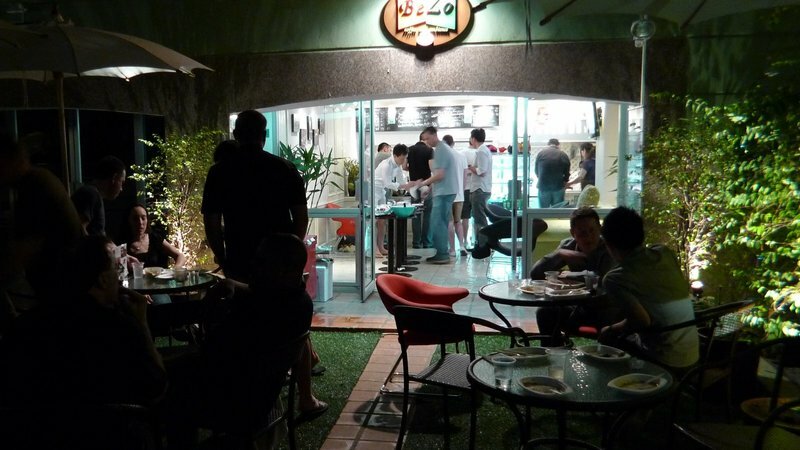 @bengozen – Check out this previous entry for the back-story.